Junior hockey fans are some of the best in hockey. They fill cold barns in cities across the country to cheer on their hometown boys, no matter the circumstances. So this week, the WHL’s Vancouver Giants decided to return the favour. The team has one specifically dedicated fan that they wanted to give a special surprise. 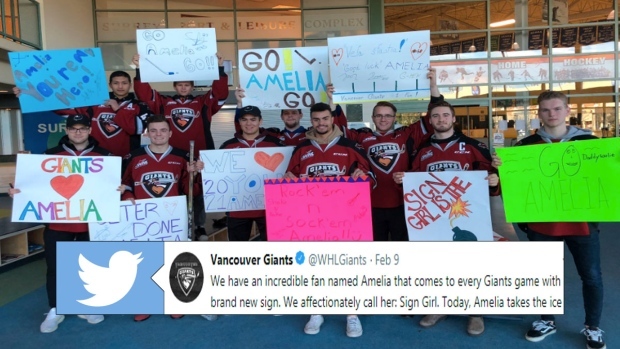 Amelia, who is also referred to as ‘Sign Girl’, attends every single Giants home game with a new sign. When the team heard that she would be participating in her first ever hockey practice, they knew they had to be just as supportive of her. So, they showed up to her practice with custom signs of their own. What an absolutely class act.The Giants are just as impressive on the ice as they are on, and have already clinched a playoff berth, sitting second in the Western Conference of the WHL. The Giants definitely have a lifelong fan in Amelia, and it looks as though she has a lifelong fan in them.